OK, start with something simpler; often the first class discussion on a pure maths degree … What IS a number? How would you answer that? Now, if you’ve pointed at something, perhaps even pictured something, you’re wrong. A number is an entirely abstract concept, which doesn’t really exist in our world. You can find numbers at work in nature but you don’t see them. You can see two people, two cars, two sheep, two of anything at all but you’re not seeing the number two. You can take a pencil and paper and draw a representation of the number two in as many ways as you like (the figure ‘2’, two dots, or anything else) but that isn’t the number two. There might be two sides to an argument or two ways to the post office but you still don’t see the number two and you never will – at least, not in this life. And much the same is true of an algorithm. We can write algorithms on paper and load them in digital form to a computer. We can discuss them, test them, compare and refine them, invent new ones, etc. but an algorithm itself remains abstract. And, as with numbers, algorithms aren’t just concepts we’ve dreamed up; they’re at work in nature too, possibly the most dramatic of all being the Algorithm of Evolution (AoE) – the algorithm that got us to where we are today. We can’t see the algorithm itself but we can describe it and we can hardly miss the result. It might not be entirely clear where we get the ‘initial population’ from. (The ‘Primordial Soup’? Outer Space? Genesis?) But, once we’ve got something, we’re off … Thus the strongest survive and the weakest die in a stable or changing environment. Now, whether or not this algorithm actually works, is rather difficult to answer. It certainly does something, but what? In simple terms, it’s produced us (together with a whole lot of other stuff) but is that … um, the ‘right answer’? In algorithmic terms, is it (are we) optimal? This is an example of a local search algorithm. In conventional terms, the initial solution is just some starting point – possibly a best guess – and we’d stop when we’d found the best answer or we couldn’t be bothered to look any more or (somewhere between the two) when, although we may not have found the best answer, it looks as if we’re not going to find anything better. That just leaves the definition of ‘best’ and ‘better’ in terms of solution ‘quality’. 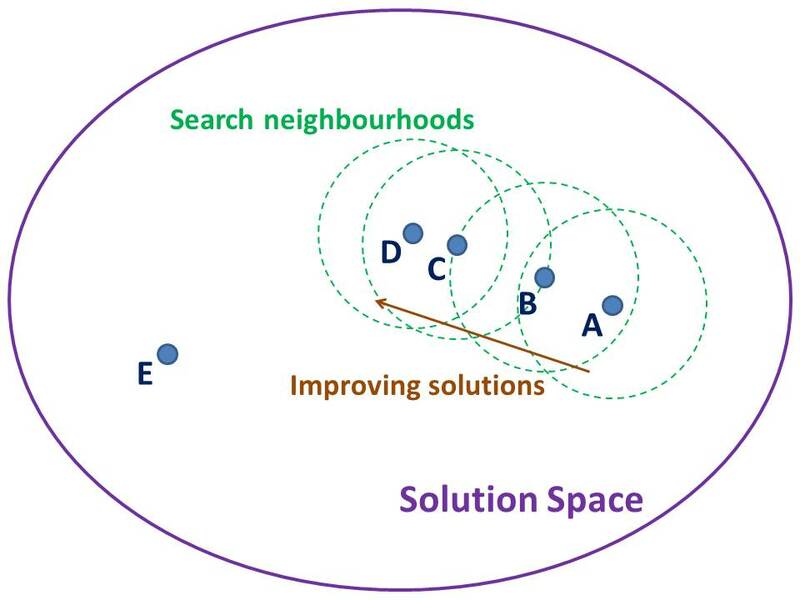 Optimisation algorithms generally work by trying to minimise the cost of solutions to a given problem. Cost – defined mathematically as a function of the parameters describing solutions – is usually a measure of how bad a solution is so the lowest cost solution will be the best. Examples are the Minimum Spanning Tree (MST) problem and the Travelling Salesman Problem (TSP). But there’s a crucial difference between these two: the MST has a simple algorithm that produces a perfect (optimal) solution so we don’t need local search algorithms like the one above; the TSP, on the other hand, probably doesn’t – so we might. This suggests the algorithm identifying solutions A, B, C and D in sequence but heading off ‘in the wrong direction’ to find the perfect E. You can imagine the hills and valleys of the 1-D model in this 2-D version too. Now imagine looking for the lowest point in the dark, with a lantern that could only light up so much area around you. You’d end up in some valley or other (a local minimum) but you might not find the lowest of all (the global minimum). Although optimisation algorithms generally work in much higher dimensions (because they have many input variables), both these simple views illustrate their basic operation and show why they’re flawed. So, in turn, it’s pretty obvious that the AoE is a local search algorithm. But what about it’s cost measure? 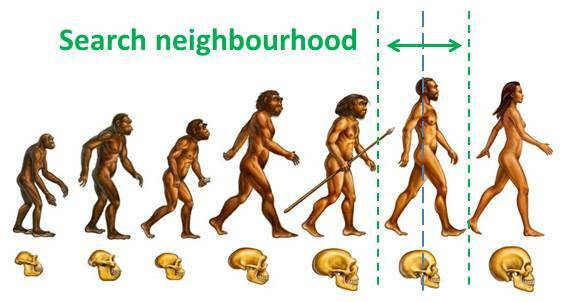 If homo sapiens evolved from neanderthals because they have ‘lower cost’, what cost? This is where things get a bit messy. There is no explicit cost function in the AoE. Instead, cost is implicitly built into the algorithm itself, in the way individuals interact with their environment; more precisely, in the way that individuals’ characteristics are evaluated by their living conditions leading to these living conditions modifying the next generation of characteristics. In a sense, the algorithm is distributed; the individuals produce their mutations but the environment does the evaluation (selection). Also, of course, these living conditions change over time in the real AoE and can be different in different parts of the world. A theoretical genetic algorithm (or any other local search) would produce a single solution but the AoE has produced a huge range of species – often co-exisitng but many found only in certain environments. Nevertheless, the AoE is a local search algorithm, which means it may or may not be optimal. 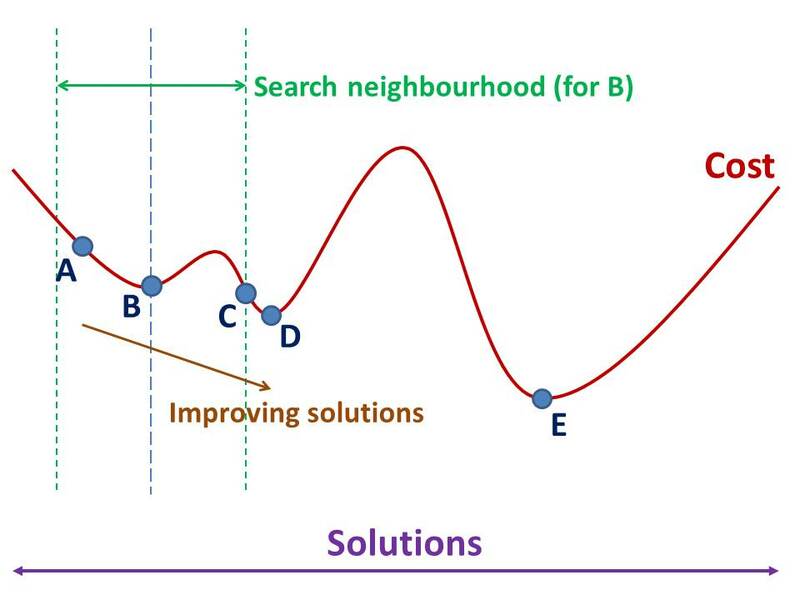 (Some simple local searches acting on certain problems will produce the global optimum but many won’t.) So, how has it done? There’s a reasonable chance that we’re about the right height, weight, proportion, that our skin is the right thickness and our sight and hearing as good as they need to be because any subtly different, better design would probably be found by the AoE’s iterative local search process acting on the current solution and finding improvements, if there are any, within its range. (Although it’s possible it may not have quite got there yet: we could still be following our mysterious cost function downhill.) But how about more drastic changes; solutions much further away in the solution space? Let’s take a specific example … Why don’t we have wheels? Surely, they’d be better than legs. After all, we don’t put legs on cars and bikes. Why haven’t we evolved wheels? Even if it didn’t work out, why hasn’t the AoE given it a go? Richard Dawkins tries to explain this with the ‘Selfish Gene‘ model … If you have wheels, you need roads; and roads suggest cooperation; and life doesn’t do cooperation (apparently). But the real explanation is far simpler … A wheel rotates on an axle, the wheel and the axle being separate pieces. For a biological system, this either means an incredibly complex system for transmitting blood, nerves, etc. to the wheels – one that doesn’t get all twisted up as the wheel turns – or the wheel has to be a separate, self-sufficient biological unit. Either way, that’s a massive evolutionary step – with no obvious local minima along the way – and the local search simply won’t find such a distant solution. Dawkins himself describes this as “The wheel may be one of those cases where the engineering solution can be seen in plain view, yet be unattainable in evolution because it lies the other side of a deep valley”. In our terms, it’s the other way around: it’s the deepest valley we want … but it’s too far away and hidden between the hills. Is evolution an astonishing, wonderful process that’s produced the diverse beauty that surrounds us? Yes. Is it/are we perfect? No. This entry was posted on Monday, February 3rd, 2014 at 9:11 pm	and tagged with Cost function, Evolution, Genetic algorithms, Global minimum, Greedy algorithms, Local minimum, Local search algorithms, Optimisation, Richard Dawkins, Selection and posted in Algorithms, Computer Science, Philosophy, Science. You can follow any responses to this entry through the RSS 2.0 feed. « Should We Mind the ‘Reality Gap’? There are billions of supremely rigid algorithms at service throughout the known universe. Let’s take an example of the incredibly simple algorithm of human waste removal. It works perfectly fine in normal circumstances; however, if this algorithm was not any GOOD, human would ultimately Blast!! Eventually there would be billions of Blasts every day. As for numbers, we could ask these profound questions to Arab scientists who set the stage of modern sciences (Acquired Knowledge) from 7th century, especially Abū ʿAbdallāh Muḥammad ibn Mūsā al-Khwārizmī who came up with ALGEBRA, Arithmetic, Astronomy, Trigonometry, Geographical concepts , but he died long ago. There are a special feedback in man’s behavior. 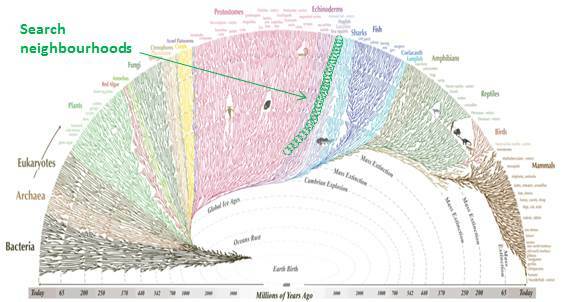 Mind can see the future and this means a more complex evolutionary schema. If you use this hipotessis, there is fascinating speed in local algorithms and reality teach us that some solutions are not at scope.